Sorry for the late post this week. I had been preparing material this weekend for a post originally titled "A better alternative than Continental-United", but then CAL beat me to the punch with their Sunday no-merger announcement. Despite the fact that I wrote an editorial in the Chronicle a number of years ago calling for a CAL-UAL merger, I had shifted to a more neutral stance over the last year, and actually decided I was opposed last week. IAH, which is really growing as a global hub, could be relegated to regional status as "our Latin America operation"
Right now, CAL has a lot of very nice, ultra-long-range, international-serving 787s on order. Most will go to Newark, but Houston may get some. Under a merger, Houston would probably lose out to Asia deployments from SF and Chicago. No distracting merger mess. They can seize opportunities as other airlines struggle to consolidate and integrate. They would dominate the most lucrative market in America, New York, with strong flights from all three major airports there: LaGuardia, JFK, and Newark. Looks like the would have about 40% market share, which is enough to dominate but shouldn't be an anti-trust issue. BA is capacity constrained at its Heathrow hub. CAL can take some of the pressure off with flights to/from Europe via Newark. New partners create some very nice route and connection possibilities from Houston: through Tokyo on JAL, through Hong Kong on Cathay Pacific, through London on BA, or even to Australia on Qantas. All good, high-quality airlines. They would lose a lot of customers from the Midwest and Southeast that are loyal to NWA and Delta (SkyTeam), but pick up plenty of loyal AA customers from both coasts as well as Chicago and DFW. AA has a reasonably strong presence in CA, which routes very well through IAH to Latin America (actually better than DFW or Miami on AA). All in all, it looks like a very good decision on Continental's part, as most comments seem to agree. Good for the company, and definitely good for Houston. I feel compelled to respond to Sunday's Chronicle story on public support for zoning and the debate it has sparked in the paper (Kendall Miller/HRG response, former Mayor Bob Lanier response calling for a formal zoning vote (vs. the "backdoor zoning" sometimes being implemented piecemeal now), and pro-planning response to his response, Chronicle editorial board), but I'm not sure what to say that isn't going to be a repeat of everything I've been saying on this blog for three years. "Need better land-use planning to guide development, or leave people free to build wherever they want?" "Need more government control of land-use, or leave people free to control their own property?" There's also an inherent conflict here, as people support both "neighborhood protection" and "redeveloping older urban areas was the best way to absorb population growth" i.e. increasing density. The fact is, we're doing absolutely great on the latter- better than most cities - and that means less sprawl, less driving, lower air pollution, and a more vibrant core. And the best approach to neighborhood protection is debatable. Certainly it seems voluntary deed restrictions can do just about everything for neighborhood protection that zoning can, although maybe that process needs to be streamlined to be less cumbersome. And I agree with City Controller Annise Parker that limiting high-rises to major thoroughfares is a reasonable requirement, although my understanding is that the approach working through the system right now is traffic-based rather than focusing on height. Without sound development standards, he said, "we're losing our share of the middle class. We're getting flooding, air pollution, neighborhood blight and decline." We're getting a massive number of affordable townhomes built in the core with our light regulatory touch. Those townhomes are built on expensive land that either would become a McMansion instead (so much for the middle class), or not redeveloped at all if there weren't enough buyers for high-priced McMansions, in which case the original blight sticks around. Those townhomes accommodate several households that otherwise would live on an even bigger footprint in the suburbs, increasing sprawl, flooding, driving and air pollution. They also increase the tax base here, improving the city's ability to address exactly the problems he describes. So, essentially, the exact opposite of his argument is true. As reported by the Chronicle's Mike Snyder, Councilman Peter Brown, Controller Annise Parker and former Kemah Mayor Bill King all speak favorably of development regulations that fall short of conventional zoning. The incumbent, Bill White, supports more flexible ways to control urban density such as regulations concerning drainage, traffic congestion and public safety. He called zoning "an old and somewhat clumsy tool." Mostly good and agreeable, except for the statement that Peter Brown's desire for a form-based code "falls short of conventional zoning." Conventional zoning simply specifies land-use, i.e. single-family residential, commercial, industrial, etc. His code would allow mixing of commercial and residential (a slight loosening), while specifying in great detail exactly how buildings would be built (min and max height, parking amount and location, required sidewalk retail, zero setbacks, etc.). If anything, that seems to go beyond conventional zoning in terms of restrictions and controls. City after American city has answered friction between redevelopment of inner-city areas and neighborhood concerns with such restrictions over the past 40 years, only to find that well-intentioned land use controls have caused economic woes, greater congestion and even urban decay. Further, these restrictions have done little or nothing to relieve such friction. Meanwhile, the Federal Reserve Bank of Dallas recently noted that because local government polices here don't artificially distort consumer-driven growth, Houston tops major cities in resisting the economic problems now affecting most large cities. Other national experts cite Houston as an example of a city that "got it right." There are responsible paths to balance legitimate neighborhood concerns with a healthy trend to greater population density within Houston. Improvement of the cumbersome process for renewing and updating neighborhood deed restrictions is part of the solution, and other market-sensitive answers would serve us all far better than the heavy-handed land use controls that some advocate. Certainly infrastructure needs to be planned (with adaptations when circumstances change), but cities need to be thought of more like the market economy or a natural ecosystem than an architect'ed building: they're not planned - they evolve. The new 2008 Fortune 500 list is out, and Houston and Texas continue to be big winners. As I predicted last year, Texas passed up New York to be the number one state in the nation for F500 headquarters, with 58 to 55 for NY and 52 for CA. Just 3 years ago, Texas was third behind both CA and NY, with only 48, but has added an impressive 10 more since then. The future growth looks good for Texas too, with 11 companies ranked between 500 and 600 poised to move up (although most are around DFW). Houston has also been a steady gainer, from 20 in 2005 to 22 in 2007 to 25 today. We're still #2 to NYC, but they dropped from 45 to 43, so we gained a net +5 in one year - a pretty big move. Most of the Wall Street turmoil has been in the last few months, which won't show up hitting NYC until next year's list. Dallas (12), Chicago (12), and Atlanta (9 - a hard fall from 14 in 2005) are the next ones on the list, so we're well ahead at the #2 spot. Of course, that's city data, not metro. We only pick up one more to 26 in the metro count (Anadarko in The Woodlands), but Chicago and possibly the SF Bay Area would match or exceed us on a metro basis (technically, the Census considers SF and San Jose separate metros, but most people would admit that doesn't really make any more sense than splitting Dallas and Ft. Worth). ConocoPhillips is our largest at #5, but you have to consider that Exxon (#2) and Chevron (#3) keep a heck of a lot of employees here, if not their HQs (and certainly Wal-Mart, #1, does too, but that's a little different). They also kept Halliburton on our list, despite the brouhaha over the CEO officing in Dubai. Business experts say it's a matter of simple economics — Texas attracts companies with its low taxes, affordable land and large labor force. "Cost is overwhelmingly the No. 1 driver," said Albert W. Niemi Jr., dean of the business school at Southern Methodist University, who wrote his doctoral thesis about companies leaving the Northeast for the Sun Belt 30 years ago. Texas has been attracting big companies from out of state for nearly three decades, including American Airlines in 1979. Exxon — before it bought Mobil — and J.C. Penney Co. arrived in the following decade. All three came from New York. In recent years, Fortune 500 companies such as Tenet Healthcare Corp. and — just last year — engineering and construction company Fluor Corp. moved in from California. The reverse Gold Rush from California to Texas has concerned West Coast officials for years. In 2004, consultant Bain & Co. surveyed big companies for a California business group and found that half planned to shift jobs out of state or at least stop expanding in California because of high costs, including taxes. Of that group, 27 percent said they would go to Texas, more than any other state. Lyssa Jenkens, chief economist for the Greater Dallas Chamber of Commerce, said there is a snowball effect — once a few big companies move in, others follow. "If you move to Dallas-Fort Worth or Houston, you're in the company of other large companies," she said. "They like to be near each other because there are all kinds of services for corporate headquarters — law, accounting, engineering, (information technology) services." I hear people knock Texas and Houston for being "too cheap," but people forget how powerful that affordability - housing, cost of living, taxes, etc. - is for growth. Thanks to Brian for the heads up and stats. Kuff recently posted his thoughts on the spiraling cost estimates for the Metro Solutions plan. He raises a very good point that our core surface streets (as opposed to the freeways) are getting more and more congested as the core densifies. I've wondered myself about their carrying limit. Are they doomed to get as bad as Uptown? Or worse? His solution is rail transit to carry more of those trips, while dismissing buses (also stuck in traffic) and bus rapid-transit/BRT (politics). First, the unfortunate results from cities like LA (with even worse street congestion) is that transit-oriented development only shifts a tiny fraction of those residents onto transit. The vast majority still use cars for most of their trips. Sure, a little bit is better than nothing, but its not going to be the solution. I was also hoping it would be the answer, but all the results I see from other cities are discouraging. Heck, even NYC with it's incredible transit system has gridlock in Manhattan and is trying to get congestion pricing to alleviate it (a friend of mine says his daily 1.5-mile Manhattan commute in a taxi takes 30-40 minutes!). Second, the streets with the congestion problems are served by the Universities line (was always going to be rail), and maybe to some extent by the Uptown line (was BRT, now rail). It's not really a valid argument for the North, East, or Southeast lines, since their streets have little congestion. Third, people weren't happy before, but they did come around to BRT eventually. As I pointed out before, $50K per daily rider - or a new Minute Maid Stadium every 2 miles (new data: every 3.5 miles) - is just a crazy amount to spend for rail on those low ridership lines. The public can be convinced, it just takes officials concerned with fiscal responsibility who are willing to educate them. Yes citizens have shown a preference for rail over BRT. But it's been framed as "given this route network, which would you prefer? ", when the real question should be (with BRT so much cheaper), "you can have small route network A with rail, or much larger (1.5x+) route network B with BRT - and then we'll upgrade lines to rail that have enough ridership to justify it." That makes the BRT case a whole lot more compelling by tapping many more neighborhoods, people, and destinations. It also better fits Mayor White's motto when he first modified the plan to BRT: "We want more service, sooner rather than later." Houston has been extremely successful with our starter light rail line on Main Street. Of course, that line picked the "low hanging fruit" by connecting many key destinations in a very short distance (including acting as a parking shuttle for the medical center). I am very concerned that that success is leading to complacency with this expansion, and that we're going to wake up in a few years with many billions down the drain (far more than originally estimated) for very nice but sparsely occupied trains - and the cost overruns will make the public lose any appetite for expanding it further. Will it take our own "Big Dig"-level crisis before we learn our lesson? Just wanted to let everyone know your friendly neighborhood blogger will be on the Ken Hoffman and Raheel Ramzanali Show on 1560 AM from noon to 2pm Thursday April 17th. They like the blog and want to talk about all sorts of Houston stuff. Wish me well - this real-time/live thing is very different from all the editing I get to do on my posts. If you're at your computer, you can listen online here. The leading candidates are United and Continental Airlines, which have explored the idea. The airlines may now try to get the deal wrapped up within the next 30 days, a person with direct knowledge of the negotiations said Monday night. He spoke on condition of anonymity because the talks are private. One reason for the urgency is that airlines want to get their deals approved by the Justice Department under the Bush administration, rather than risk seeing them stall until a new president takes office. United’s chief executive, Glenn F. Tilton, has been eager for a merger, but Continental had resisted, saying it wanted to wait to see if the combination between Delta and Northwest came about. The chief executive of Continental, Lawrence W. Kellner, called it “good news” last month when it appeared that the Delta-Northwest talks had cooled. But Mr. Kellner could end up running the combined Continental-United, should an agreement take place, this person said. The Chronicle also has their take, as well as Reuters. My previous thoughts on the topic are here and here. ...Houston’s metropolitan population growth would indicate an increase to in the neighborhood of 4.4 million in 2006. On that assumption, Houston’s daily vehicle miles traveled per capita would be 22.7, 20 percent below San Antonio, 10 percent below Dallas-Fort Worth, lower than Los Angeles and only 10 percent higher than Portland. The NY Times talks about Houston's newest PR campaign, and actually says some nice things about our town. Hat tip to Tom. Texas is #2 in tech job creation, after CA. AP story on the Houston boom. Thanks HAIF. While much of America wrestles with a mortgage crisis, a credit crunch and higher living costs, the nation’s fourth-largest city is bustling. At 3.4 percent, February’s job growth in Houston led the nation among the 12 largest metropolitan areas in the past year, government figures show. That was down slightly from its January rate of 3.9 percent but still far ahead of the national average of 0.6 percent. The housing market, though slowing somewhat, remains relatively strong compared to other big cities. And Houston’s manufacturing and construction sectors are growing, bucking the national trend. No wonder the Census Bureau last week said metropolitan Houston, already home to about 5.5 million people, ranked as one of the country’s biggest population gainers in the past year. Brian has started a new blog with nothing but stats on Houston. Check it out. "The ugliest McMansion in the world could be built, and it wouldn't rip neighborhoods apart like this process does," said Josh Doherty, who with his wife, Dawn, and others successfully fought the so-called Maplewood overlay. Overlay is shorthand for what the city has officially dubbed a "neighborhood stabilization overlay," a zoning device that planners hoped would end unrest over new construction in established neighborhoods. Instead of peace, overlays in many areas have sparked neighborhood civil wars. Conceived in 2005, the idea was to give older, established neighborhoods a way to preserve their scale in places where lots have become more valuable than homes and giant new houses have sprouted up, dwarfing their neighbors. But what resulted in many cases are knock-down, drag-out fights that land before the City Council with the nasty thud of neighbors at each other's throats. A solid case of "beware what you wish for," if you ask me, and a warning for Houston not to make the same mistake. Finally, to end with a little humor: the Onion turns the tables on gentrification, as aristocrats shove out upper class professionals. It's a little weird, but funny. Lots of small misc items have been building up - so many I'm going to break them up into two posts. More next week. The CEOs for Cities blog covers 8 quality of life metrics for Houston. Can't really argue. All good stuff (assuming by "Tax Delinquent or Abandoned Lots" they mean ones that have been reclaimed and redeveloped). "Among other things, I'll talk about why Austin's neighborhood activists are such enemies of increased density. The short answer, IMHO: they want to maximize home value. I don't know that you can expect anything else, really -- people generally will act to maintain or increase their net worth. But we should be spared the moral posturing. There's nothing noble about asking the city council to crimp the housing supply for your economic benefit. These same neighborhood activists who do their best to limit the supply of housing and drive up home values are also the most vocal advocates of affordable (i.e., subsidized) housing, environmental protection, and the preservation of inner city schools -- all goals perfectly incompatible with their agitation for less density. These inconsistencies will be one of the main themes of this blog." 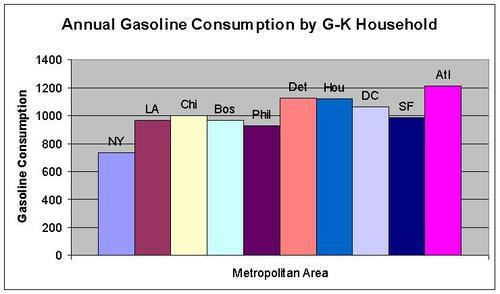 From that same blog, an analysis shows that Houston doesn't use much more gas than far denser cities, despite our reputation for sprawl, and the assumption that that leads to far more driving and gas consumption. Finally, and important pass-along from the American Dream Coalition. I will be moderating a panel there on "Houston's Past and Future" Friday night May 16th. Hope to see you there. In just seven weeks, dozens of the world's leading experts on urban growth and transportation will converge on Houston to talk about housing affordability, traffic congestion, and how freedom and property rights can produce urban livability. I hope you join us at the 2008 Preserving the American Dream Conference. * The state of property rights in the U.S.
See http://americandreamcoalition.org/pad08.html for the latest list of speakers and details about how to register. I know you won't want to miss the greatest national gathering focusing on free-market solutions to urban problems. I hope you can also forward this email or link to your friends and associates who might also be interested. I've been meaning to pass this story from the NY Times on the relationship between fertility and housing along for quite a while. First the excerpts, then my comments. For the first time in 35 years, America’s total fertility rate — the estimated number of children a woman will have in her lifetime — reached 2.1, the theoretical level required to maintain the country’s population, according to recent data from the National Center for Health Statistics. But at a time when no cocktail conversation is complete without a discussion of real estate, the boomlet raises a question that has long interested social scientists: What is the relationship between fertility and real estate? For decades, Americans have built increasingly bigger houses, even as family size declined. Bigger houses mean incentives to stay home and fructify, Mr. Kahn said. I've posted on this topic before, and summed it up with rule "rising affluence seeks more private space." As they state above, in the U.S., that means buying a bigger house (typically in suburban "sprawl") to accommodate the same size family. Or, if forced to stay in denser or smaller housing for affordability, mobility, or regulatory reasons (like anti-'McMansion' ordinances, urban growth boundaries, etc. ), as in Europe, Japan, and in many U.S. urban areas, they will shrink the size of their families to compensate and create more space per person. If you can't grow the house, you have to shrink the household. This doesn't mean density is bad - it's a fine choice for those who want to live that way. But it's bad public policy to try to force it. This also doesn't mean people are sitting around saying "Hmmm... we have a big house. Might as well fill it with kids." Instead, there are a lot of couples and families in cramped housing trying to decide if they can afford to upgrade to more space and increase their family size, or if they're stuck where they are at their current household size. If they can get the space they feel they need, the kids will come. It's time for the Winter 1Q08 quarterly highlights post. These posts have been chosen with a particular focus on significant ideas I'd like to see kept alive for discussion and action, and they're mainly targeted at new readers who want to get caught up with a quick overview of the Houston Strategies landscape. I also like to track what I think of as "reference posts" that sum up a particular topic or argument. Don't forget we offer an email option for the roughly twice/week posts - see the Google Groups subscription signup box in the right sidebar. An RSS feed link (Atom) (or RSS 2.0) is also available. As always, thanks for your readership. And don't forget the highlights from the first three years. For what it's worth, I think the best ideas are found there, often in the first year (I had a lot "stored up" before I started blogging).